What is a Blind Massage? So Benjamin was back in town last week and staying with me. A few friends including Jenny, Phred, Andrew were planning to go to this new place they found that had massages for 40quai (a pretty good deal for a one hour massage), so Benjamin and I tagged along. We took the Metro clear across town to Hanko. It was really weird because unlike a massage table in the U.S. these were all jammed together with just a small walking space in between. An hour later I felt fantastic and ready to face my classes. Oh yeah, I didn’t answer the original question – a Blind Massage like the name implies is run by blind people. There were several (7-8) massage therapists or whatever and they were all blind people that had been taught the art of massage as a means of making a living, because there is no disability benefits in China. I of course didn’t know this and thought that blind massage meant that you put your face into the hole in the table and couldn’t see anything. When I explained my theory to Phred and Benjamin, they insisted that I write about it, and also laughed hysterically at me. 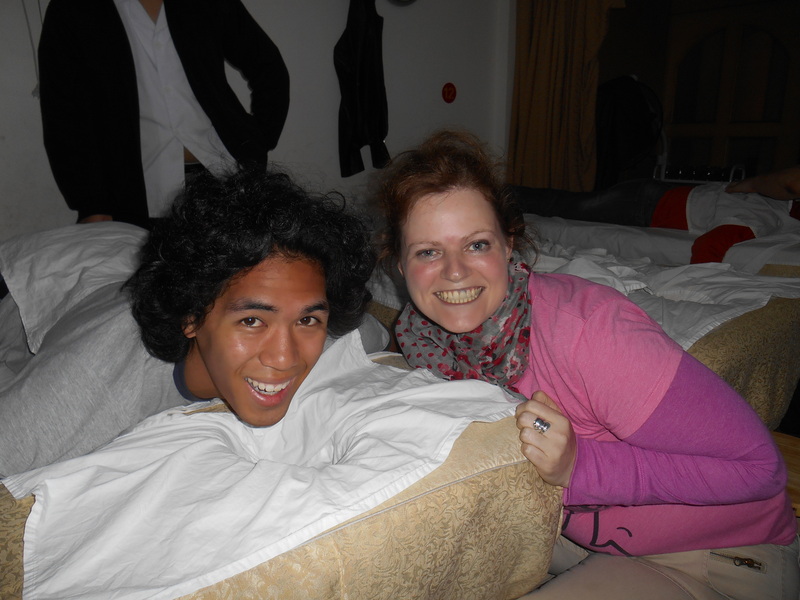 Here’s a picture of Phred and I.
I am learning so much through your travel. Keep it coming. Thanks Sandy! Great hearing from you.